March is here and excitement is building for Star Wars Galaxy’s Edge. This Crowd Calendar update assumes the new land will open on or around June 19, 2019. Once it does, Disneyland will be jammed. Disney California Adventure may even see a bump in crowds as the hoards of Star Wars fans (and non-fans) balk at the long lines and head to the other park. Keep in mind that the Disneyland Crowd Calendar represents the average wait times expected at Disneyland’s key attractions but that the new Star Wars attractions are not yet included. They are too new. Once we observe the wait times at Star Wars Galaxy’s Edge for a year we can add the new attractions to the list of those we use for the calendar. Wait times at Disney California Adventure have been more volatile than normal so far in 2019, a phenomenon we have also observed at Walt Disney World’s Animal Kingdom. Read more on that here. How the Crowd Calendar does in March will depend a lot on whether this trend continues. Disneyland crowds have been slightly lighter than usual so far in 2019 although much of that is due to the cooler than usual temperatures. Now that details are out about this summer’s new land it may be the case that guests put off trips to the resort until they can check out the new Star Wars attractions in June. 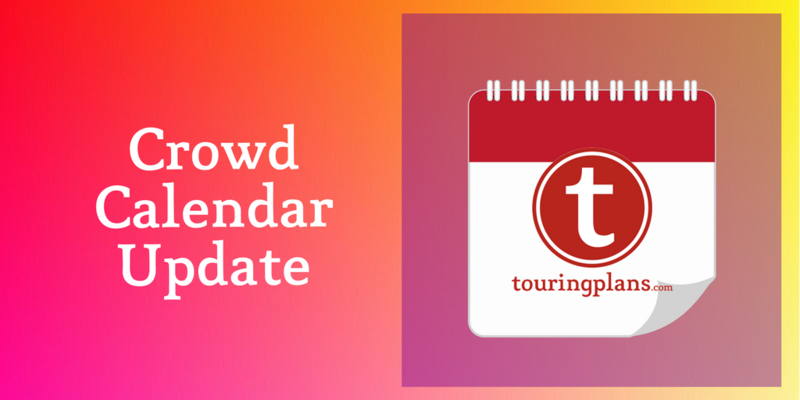 The trend for April on this update is for crowd levels to go down slightly. We still expect to see extreme crowds at Easter time however. This means that between April 15 and April 26 the crowds will be very busy. The exception is Easter Sunday itself where the Crowd Calendar shows a ‘6’ at both parks – this is what we observed last year as well. Many days in May are dropping at Disneyland as a result of this update. This seems reasonable since many guests will delay their trip until Star Wars Galaxy’s Edge opens in June. May crowd levels might go up during our next update if we observe higher than expected wait times in late March and early April. May is still a favorite time to visit for many of us at TouringPlans.com. Crowds are light, the weather is pleasant and park hours are generous for getting in those extra rides at night. June is all about Star Wars. Despite the recent media campaign we still know very little about how the new land will operate. We anticipate several thousand guests a day will be willing to wait all night long for a chance to tour Batuu and drink the blue milk. But how will Disney control access to the land? Separate tickets? FastPasses? First come, first served? Needless to say, Disneyland will be jam packed when it opens. The increase in wait times that we see at the non-Star Wars attractions and at Disney California Adventure will be interesting to follow. Our estimates indicate a bump of 10 to 22% depending on the attraction. Once we know more details about the plan for crowd flow into Star Wars Galaxy’s Edge we will update our forecasts for the resort. Forecasts are up for July but not every day. This update brings several increases to Disneyland of a point or two but not many days more than 2 points. Some July days at Disney California Adventure actually go down as a result of this update. That may change once we see how Star Wars Galaxy Edge impacts the parks. The last half of the year will see a mix of changes as a result of this update. Again, a lot will depend on what happens at Star Wars. Even though this fall will see some low crowd numbers we think the new Star Wars attractions will see multi-hour wait times daily until late into 2020. Recall that the new Star Wars rides are not part of the calendar so when you see a ‘1’ or a ‘2’, that represents a low wait time at the existing attractions. Note that the day after Labor Day is the first day that Southern California Select Passholders can visit Star Wars Galaxy’s Edge using their pass. We expect that rush of passholders to push the park to a level ‘8’ or above for at least a couple days. That is significantly higher than that week would be historically. Got any questions about this update? Let us know in the comments. I’m wondering if you’re compensating for the fact all DAP will only have access to DCA all summer. I think this will up the crowds there considerably. As it was last summer DCA had a lot more 8-10 crowd level days than DL. It is a fair point Roseann, we may see a spike at DCA. A lot will depend on what we see during the spring break season over the next several weeks. I think wait times are up at DCA now because of the volatility of posted times. I have a hunch that trend will end in the next few weeks and we will see DCA’s numbers return to normal by this summer. I also think Disney is prepared for the summer rush at DCA as a result of the passholder blockouts. These updates represent a resort-wide adjustment to all of our attraction models. It may seem like a jump from a ‘7’ to a ‘3’ is extreme but in terms of actual difference in wait times it isn’t as drastic as you may think. Really, this represents a change from an above average day to a below average one. With Easter falling late in April I think these low crowd levels after the holiday are reasonable. I just looked at the TP graphs for line times at several big rides, and I see what you mean. Radiator Springs Racers is estimated at 115 minutes peak wait for CL-7 and 100 minutes for CL-3. I think I tend to picture a scale in which “1” equals an empty park and “10” means people are so squashed they can’t walk around! 🙂 Obviously these are nuances within a more normal range… Thanks! Boy I wish you’d sent this sooner, as I already booked flights for the week after Labor Day as that showed the lowest crowd levels. How sure are you about these numbers? Changing flights costs $$. On average our calendar estimates are correct within one index point. We get within two index points about 85% of the time. Those increases are purely a reflection of the Annual Passholders having their first access to Star Wars Galaxy’s Edge. I think if you avoid that area of the park the crowds will actually be fairly manageable. Thanks – that is helpful. Of course, the whole point of the trip is to get to Star Wars Galaxy’s Edge!! I think I just need to keep in mind there are a lot of unknowns until it opens and we know the impact. We’re out of state and doing a trip May 18th through the 21st. We committed before the discounted DLR tickets (including the California resident discounts) became available. Now I’m worried about the impact of the discount tickets in that last week when they’re still in effect, that there will be a rush to get them used. Am I worrying unnecessarily, or has that already been figured into the projections for those days? Any idea when the after hours dates will be released for June? I saw my crowd level for Sunday, August 11th cut down to a 2 for Disneyland Park. Is this madness? I know it does not include the Star Wars attractions, but the park as a whole should be seeing higher crowds because of Star Wars…right? With all of the talk of how much crowds Star Wars is going to attract, I find it hard to believe that a Sunday in the summer will see only a 2/10….